ROME: Italy signed on Saturday a “non-binding” protocol with China to take part in Beijing’s new “Silk Road” of transport and trade links stretching from Asia to Europe. 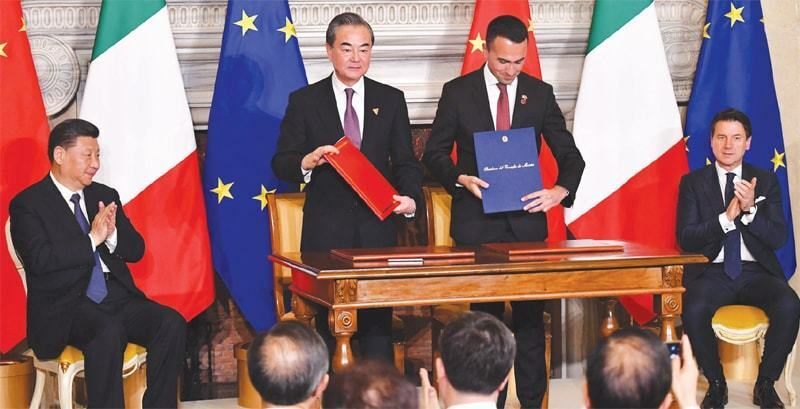 Visiting Chinese President Xi Jinping and Italian Prime Minister Giuseppe Conte attended a ceremony held for the signing of 29 memorandums of understanding which Italian media said were worth $5.6 billion to $8bn. Italian financial daily Il Sole 24 Ore said the value of the Chinese investments could rise substantially but would for now be limited to the strategic ports of Genoa and Trieste. Italy has rolled out the red carpet for Xi, who on Friday sought to allay Western unease over his transformational infrastructure initiative by emphasising the $1 trillion project’s mutual benefits. Cultural tie-ups are also on the agenda while Beijing is pushing to have several Serie A football matches played in China — although that would currently contravene regulations of the game’s governing body FIFA. But Xi has rejected any idea of a conflict of interest after talks with his Italian counterpart Sergio Mattarella. “China wants commercial exchanges to go both ways and for investment to flow in both directions,” he said. The new world order is happening, China's cash reserves are well on the target to reach to 4trillion right now at hefty 3.4 trillion, sovereigns funds are also sitting well into trillions also. There were days when they had few billions in reserves just few decades ago. They have done something right........ A lesson for us all to learn. Italy signed on Saturday a “non-binding” protocol with China. Italy would not be the last. Modi lost opportunity of a lifetime for India by avoiding Belt and Road. International relations are an intricate ball-game.